Click on a highlighted subject to see the article. All photos will enlarge. The "thrust bearing" area of the prop shaft assembly should be checked, cleaned and lightly oiled (droplet) before each day of running. 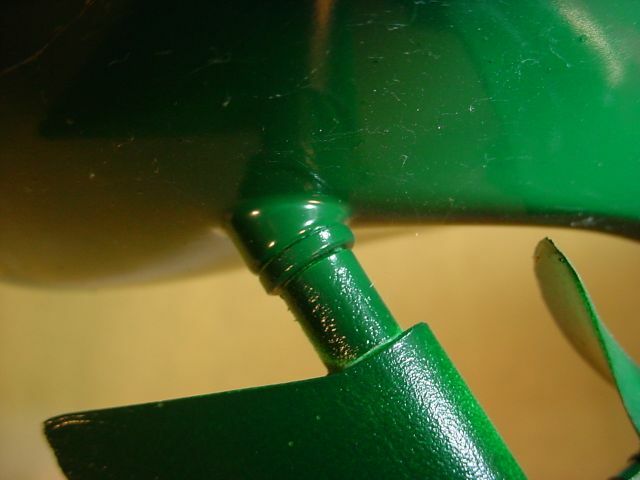 Look at the space between the drive dog and the Oilite® bearing at the end of the stern tube. You should see the prop shaft as shown in this photo. If you can't, there could be debris caught between the two surfaces. Hair from swimming pools or grass from a lake is common. Remove the debris with a razor knife, dental floss, thread or any thin object. The prop should turn freely. Use only a droplet the size of a pin head. If necessary, remove the prop nut. Grasp the shaft coupling end through the rear hatch gently to prevent shaft rotation. 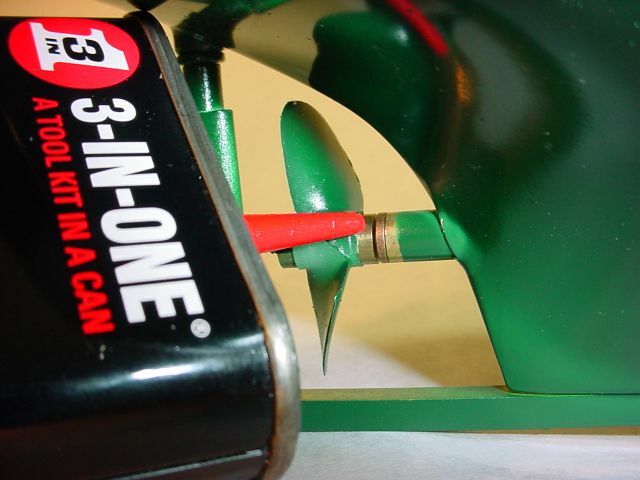 Unscrew the prop and drive dog together by turning the prop a few turns counterclockwise to increase the gap and make it easier to remove the debris. After this area is cleaned, retighten the prop/drive dog by hand. Apply a tiny amount of sewing machine or light household oil to the gap. Rotate the prop shaft several turns to distribute the oil. 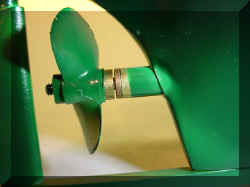 Use a paper towel to blot the excess that squeezes out when you push the prop toward the bow to make the drive dog and bearing touch. Wipe all excess. 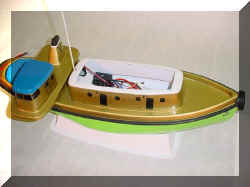 Petroleum based oil can damage the plastic hull over time. (The rudder may need oiling only once a season.) Turn on the radio, then the boat. Turn the rudder left and right. If you hear a squeak, the shaft of the rudder may need oiling at the upper Oilite® bearing. Apply a tiny amount of oil to the bottom of the bearing at the rudder. Turn the rudder left and right. Let it sit a few minutes to wick into the bearing. Wipe off the excess. Keep oil off of the hull above the bearing. 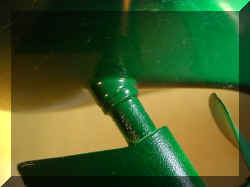 If it persists, remove the rudder and oil its shaft directly. Disconnect and remove the battery. (Most electronic speed controls "ESC" manuals insist you disconnect the batteries after use.) If you will not be running the boat for a month or more, discharge the battery to 1 volt per cell or 6 volts. Nicad batteries are best stored discharged. Nickel-Metal-Hydride NmH batteries can be stored in any state of charge. Consult the manufacturer for their recommendations. Tilt the boat forward. Look for any water that runs into the bow. Blot it up with a paper towel. There should be no leakage. If you find water, look for an opening in the deck. Keep the rear hatch opening taped over. Seal around antennas, switches, or deck accessories. Leave the cabin roof off of the boat for a couple of days to be sure that the interior of the boat is completely dry. Do this even if you don't find any water. 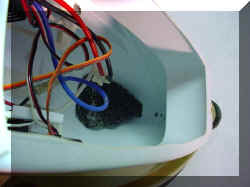 Trapped humidity can damage the motor or the electronic components of the tug. 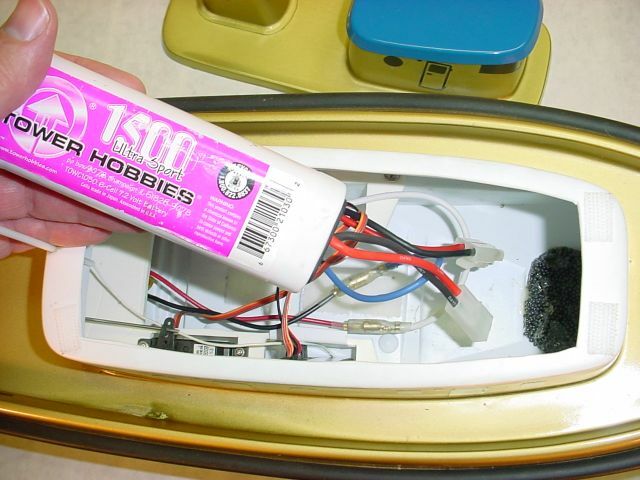 The stern tube can be refilled with grease if it ever begins to leak. I have run boats for 2 years (monthly) with the original grease and had no leaks, problems, or visible wear to the shaft upon inspection. 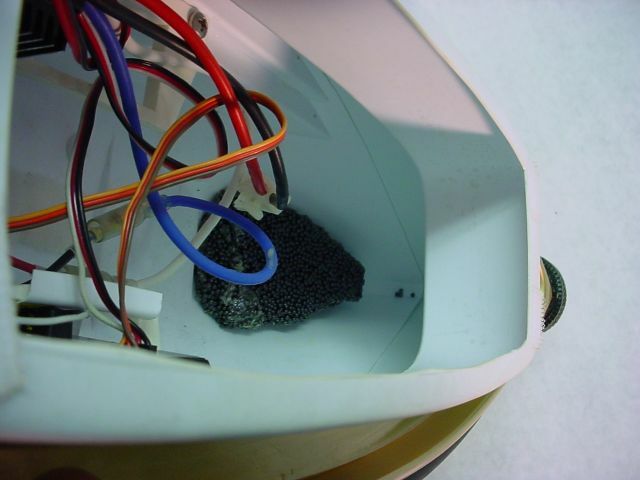 Have you heard that if an ESC or Radio Receiver ever gets wet it is destroyed? That may not be the case. 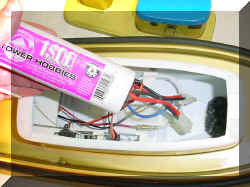 It is true that if a boat sinks and is not recovered for hours or days, the current in the battery will cause corrosion of circuit boards and component leads as current jumps gaps aided by minerals in the water. How much current is left in the battery and how long it stays under water will determine how much damage will occur. 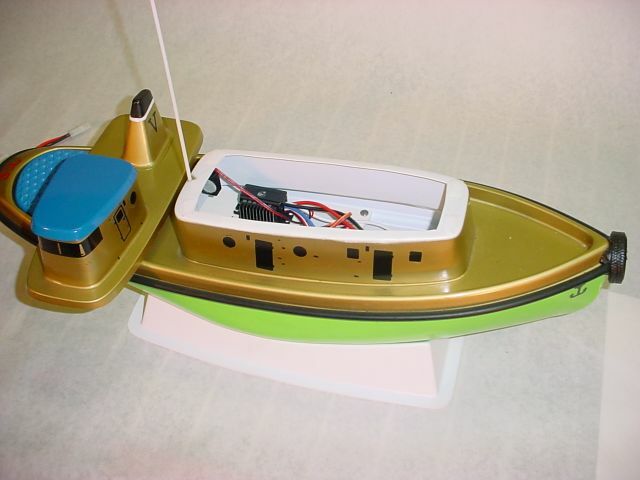 If you retrieve the boat immediately and remove the battery, it can likely be fully restored at no cost to you. If you assume that all is destroyed, then you can do no harm in trying. Use good judgment. Test cleaned components safely. Only a trained technician and an oscilloscope can verify if components are back to factory specs after cleaning. If you are in doubt, then throw the parts away and buy new ones. While I would use a cleaned ESC on a scale boat, I may not on a nitro powered racer until it could be tested. Where safety is an issue, use your own best judgment! Pure (distilled and de-ionized) water does not conduct electricity. Tap water, lake water, and certainly salt water contain salts and minerals. These minerals present in almost all natural water makes it conduct current. Electronic Speed Controls use tiny amounts of current to control large amounts of current using MOSFETS, TEMPFETS, or other types of transistors. If a little current gets conducted to the wrong place, it will cause the ESC to malfunction. Often a wet ESC will run a motor continuously for this reason. As a drop of water dries, the minerals and salts become more concentrated. The water spots you see on the surface of a window after the water has dried are rings of minerals left behind. Acid rain does damage to a car's paint only as it dries causing the acidity to become hundreds of times more concentrated that it was when it fell. As the current flows between two separated conductors under water, the surfaces of the conductors give off or gain material. This eats into the metals and is similar to the galvanic corrosion that occurs to metals on sail boats in salt water (highly conductive) or to your copper plumbing that makes blue stains in your tub. A drop of water between two conductors on a circuit board will conduct electricity and corrode the surfaces. The eroded metal enters the water causing it to conduct better. As the drop dries, it can leave a conductive trail (like the water spots on a window) that will cause voltage to leak from one point to the other. This can cause a dry ESC that has been wet to malfunction. It may still be repairable, however it is best to start the cleaning process before it has a chance to dry. Pictures and text will follow soon!